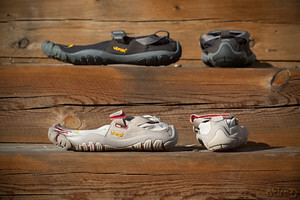 Ever since Justin showed up to work wearing them a couple of years ago, I have had my eye on a rather unique five-toed shoe made by Vibram...and been following a growing movement towards natural running (using such minimalist shoes or going barefoot). That said, I have not been willing to part with the comfort and support I have been told I needed and grown accustomed to having over years of running. In concept, what seems like a radical shift actually makes a lot of sense. The human foot is not designed to absorb impact on the heel. A quick attempt to run barefoot will discourage this behavior immediately. But, for some reason, shoes over the past couple of decades have made huge strides to assist, if not encourage such unnatural form. When I ran cross country and track in high school, I gravitated towards Nike Air for this reason. When I rediscovered running just a few years ago, I adopted Asics Gels...as much for their ability to absorb impact as their arch support and room for my toes. Around my second marathon, I made a conscious effort to shift my running form to favor ball or mid-foot strikes over the heel...and felt that the change indeed improved my pace and endurance. That said, Justin, now a former coworker, commented just the other day that I probably revert to heel striking whenever I get tired. He contends that my trusty Kayanos encourage this lazy behavior whether I realize it or not. I have kept this in mind over subsequent runs and, while I am fairly certain I run upon the balls of my feet most of the time, he is probably right. There must be a reason why I still deal with pain in my right ankle with symptoms of Plantar Fasciitis not only persisting in my right foot, but also starting in my left. 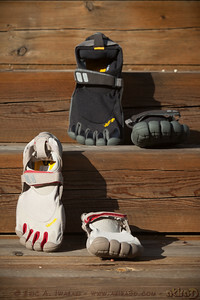 One month before a race is hardly the time for changing ones running shoes, adjusting a running style, or even making slight tweaks to a training routine, but my wife and I suddenly find ourselves at REI each trying on pairs of Vibram Five Fingers TrekSports. My former coworker's recent comments and my wife's client's experience hiking in them have encouraged us to, at least, see how they feel on our feet. The first thing I notice is that traditional shoes have done far more than alter my running form...I can barely separate my toes enough to slip them into the digits of the shoe! My left pinky toe, in particular, appears way out of alignment...almost as if it has rolled under the others to conform to the shape of what previously seemed like a generously wide toe box of my Asics Kayanos. The salesperson encourages me to step on the climbing rock to see how the shoes feel. He immediately points out how my toes naturally wrap around the contours of the uneven surface and correctly notes that I am standing more comfortably balanced than I would wearing a traditional shoe. I am notably intrigued. I had not previously given much thought to how adaptable the human foot is over uneven surfaces. The salesperson relates how he unexpectedly adopted a more cat-like posture when hiking over rocks and crossing logs while wearing the Vibrams. What would seem more challenging terrain for a nearly flat soled hiking shoe suddenly becomes a more natural path for someone wearing Vibrams. Toes and arches naturally wrap around irregular points of contact. Having run on my favorite trail earlier in the day, I immediately could appreciate the benefit. The trail had been etched by recent storms with exposed rocks and hard-packed grooves that often made it difficult to find stable footing. While I have long been concerned about how painful it might be to run over such rocks wearing the thin soled Vibram shoes, I could see how many additional ways I could have approached the rugged terrain had I been wearing them. My wife starts thinking about how well such shoes would work doing yoga since some poses require splayed toes to maintain balance. 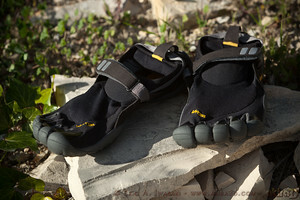 By the time my wife and I had finished trying them on, we were convinced we should buy the Vibram Five Fingers TrekSports...if not to improve our running form for our upcoming race, to strengthen muscles that should further reduce impact on aching joints before our next one.